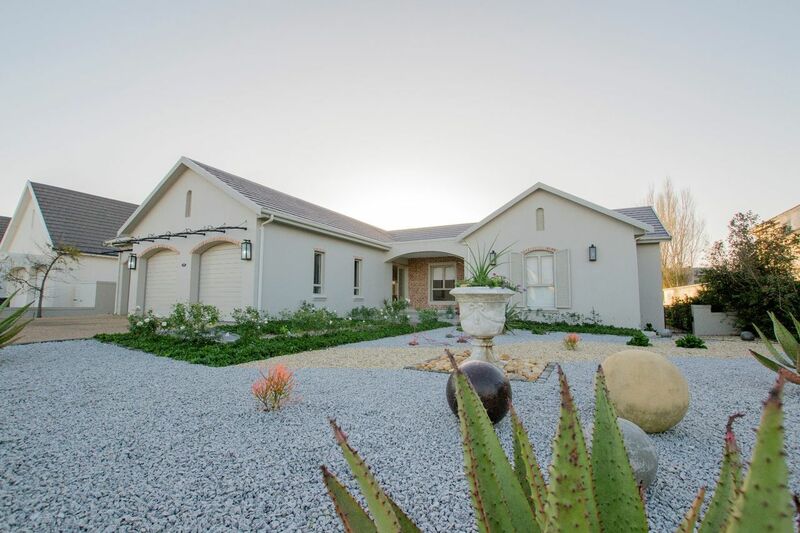 This property is home to a magnificent residence set in a well established area of Val de Vie Estate. Exquisite attention to finishes throughout, features and fittings. This distinguished home measuring 430 squares, boasts double-vaulted high ceilings and exposed trusses. The extra-length windows and doors add to the feeling of space. An entertainers dream with open-plan flow between the enormous kitchen, spacious dining; living area and entertainment braai room with foldup doors and Alluminium American Shutters. The main suite is a luxurious haven of peace and tranquility with a his and hers bathroom, outdoor shower and impressive dressing room. In addition, a private veranda to the main suite offers total privacy and a 'far away" experience. The further three bedrooms provide luxury family and guest accommodation. Perfect picturesque and easy to maintain, lemon-treed and herb garden. 3 Extra-length garages, with direct access into the scullary and kitchen, fitted with build-in cupboards and an Instant Geyser.